Let The Right One In, the West End transfer of the Royal Court production, steps into fill the empty stage left by the retreating Curious Incident of the Dog In The Nighttime following the partial collapse of the ceiling at the Apollo Theatre last December. Despite their ostensibly very different subject matters and storylines (vampires and Scandinavian dark-doings versus a teenage boy with learning difficulties playing Poirot) the two shows share themes of adolescence loneliness and alienation. Let The Right One In, an adaptation of John Ajvide Lindqvist’s Swedish horror novel (he also wrote the screenplay to the 2008 film) by BAFTA-award winning Jack Thorne, is a vampire story that’s more steeped in Dracula than Twilight. But for all its gore, and a higher body count than King Lear, Let The Right One In is a rather sweet tale of two outsiders finding solace in each other. 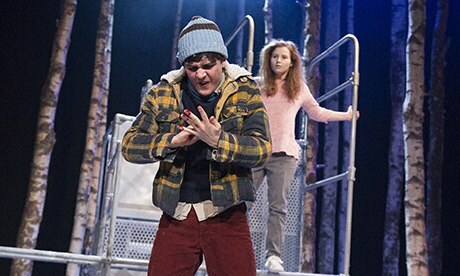 For this production, the story moves from the frozen suburbs of a Swedish town to the equally bleak Scottish Highlands in mid-winter, the set of silver birches glowing ghost-like on the perpetually low-lit stage. The deceptively simple set design later reveals itself to be far cleverer than it looks when a modest looking climbing frame becomes the focus of an impressive piece of coup de théâtre. Oskar (the characters, slightly oddly, keep their Scandinavian names), is a bullied boy who can’t find peace at home with his often-drunk, often angry mother. Not only is he vivaciously picked on, there’s now a murderer on the loose in the woods, hanging his victims from trees like pigs and draining their blood (incidentally, this is the third production I’ve seen this year where an actor strung up by their legs, it’s not a good time for actors with a fear of inversions). It’s in the now out-of-bounds woods that Oskar meets Eli, a Willo The Wisp like vampire whose otherness to Oskar is most apparent in her not knowing what a Rubik’s Cube is. He lends her his to play with and she becomes his guardian angel. For all its endearing qualities, there’s a coldness to this production that’s not just the smattering of fake snow on the stage. The dialogue and the staging are studied and remote, its artificiality exaggerated by the scene-dividing dancing that bleeds into ‘over-done-the-E-at-a-rave-in-a-forest-in-1989’ style moves. I’m a little squeamish about self-conscious theatrics (and blood, fake or real) so the tree-hugging dances made me a little queasy, almost more than the over enthusiastic, bloody necking. But the very young leads are great. Martin Quinn as Oskar is brilliant and inhabits the teenager with great conviction – he’s funny, cheeky, sensitive and confused. Rebecca Benson as the slight Eli who refuses to acknowledge who – or what – she really is, is small but mighty, her sprite-like build betraying her strong presence. This slightly disjointed production is aided by Ólafur Arnalds sweeping atmospheric soundtrack that gives the play a filmic quality and helps keep the production lifted when it starts to sag. While this may not have as much bite as the eerie Swedish film it’s adapted from, it’s an imaginative production that’s rather charming in its bloodsoaked portrayal of the perils of adolescence – with or without fangs. For tickets and more information visit www.royalcourttheatre.com. This entry was tagged Apollo theatre, horror, John Ajvide Lindqvist, Let The Right One In, Martin Quinn, Rebecca Benson, Royal Court, Scotland, Swedish, Theatre, theatre review, vampires. Bookmark the permalink. Hello! Thank you so much for this review 🙂 I wasn’t a fan of the original book but I’m glad this adaptation is successful and being Scottish I am so incredibly proud of this production for getting a London transfer.